Each year, thousands of Oregon parents hug their kids goodbye. Then they send the children tramping into the wilderness for up to a week. The kids learn about Oregon's natural wonders. The Outdoor School program began more than 50 years ago. Since then, more than 1 million Oregon children have enjoyed - or endured - this rite of passage. They participate at campsites scattered around the state. Oregon's landscape includes a stormy coast, towering evergreen forests and a rugged high desert. At the program's heyday, 90 percent of sixth-graders spent the week testing water samples. They studied fungi and dug through topsoil. Today, just half of Oregon's 11- and 12-year-olds take part. This is accomplished mostly through a patchwork of grants, fundraising, parent fees and charitable donations. A lack of money has forced many school districts to scrap the program. Some have whittled the program down to just a few days. Opponents, however, say it would take away millions in lottery money critical to expanding Oregon business. The push to fund Outdoor School dovetails with a national trend toward outdoor learning, Bodor said. More than two dozen states have developed environmental literacy plans. Educators have realized the importance of outdoor time. They say it develops critical thinking and leadership skills, Bodor said. "But ... the outdoor component is the piece that very often gets left behind," Bodor said. Measure 99 would cover that unfunded cost. It would take the money from the state lottery's economic development fund. 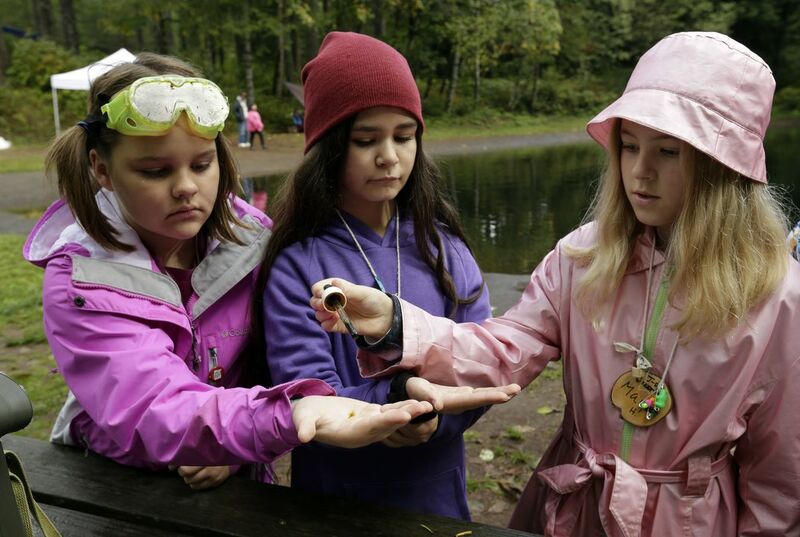 The money would send 50,000 fifth- or sixth-graders to Outdoor School each year. To get the state funding, programs would have to meet certain criteria. These include a curriculum that includes the study of plants, animals, soil and water. And it would include lessons on the relationship between economic growth, natural resources and conservation. "This is not a mandate. It's an offer. And we wanted to make sure it was a real one. (That) means providing sufficient funding to cover the cost of a good, high-quality program," said Rex Burkholder. He is chairman of the Measure 99 campaign committee. Measure 99 had no organized opposition. Polls indicated it would pass. But not everyone is buying it. State Sen. Betsy Johnson is a Democrat. She says lottery proceeds are for economic development. They are not for camp. She worries Oregonians who remember their own Outdoor School experience will vote for the measure out of nostalgia. They won't understand it could hurt other programs, she says. "It's so feel-good. It's so 'Oregon.' I just worry that people are not going to give it the level of scrutiny it deserves," Johnson said. "The assumption is Outdoor School ... will produce better citizens and good Oregonians. What's my metric to know if that really happens?" Supporters point to a Portland State University study. It found that students who participated in Outdoor School had improved attendance. They also highlight surveys by the Multnomah Education Service District. The district provides 7,000 students a year with Outdoor School. The surveys show the program boosts self-confidence. And it boosts interest in math and science. At a recent five-day camp in Mount Hood National Forest, sixth-graders seemed unaware of the politics surrounding their adventure. A light drizzle fell. The students dipped nets into a fog-cloaked pond. The kids were surrounded by stands of Douglas fir trees. 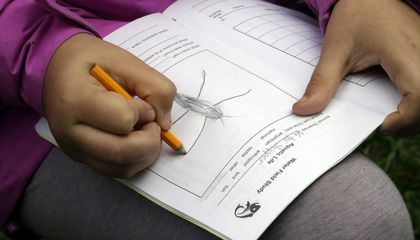 The students sketched water bugs in notebooks. They tested the water's acidity and turbidity. Rainbow trout jumped just a few feet away. Each child wore a "wood cookie." It is a cross-section of a small log. It was decorated with beaded pins. They denote the students' completion of field studies on plants, animals, soil and water. "It's definitely better out here," said Maya Herring. She is 11. Maya showed off her wood cookie. It was festooned with beads and bling. They had been awarded by her counselor. It is very interesting to see that programs like this are able to be taught at a school. Also this will help kids who want to be in this field want to do it more. Yes, but sometimes it's way to cold to do that to kids my age. I think that it's nice to give students a change in pace and a chance of getting out of the school building. Giving the students different opportunities to pursue different careers and jobs is good for the future of America. It would be good for younger kids learning about the outdoors and that your article could help other areas to start to learn the benefits of having this course. Also I like how you included how long this couse is so if someone who wants to take this class wants to see some facts about it they could just look at this article and see how long it is and other parts of the course. I think that it is a good thing that the students can get out and learn in nature directly with plants and the environment. I think that this will provide the children with different opportunities and may get better chances in the future to do things like get better jobs. It also provides a better and more fun learning experience for school and for just learning in general. There is national trend towards outdoor learning because it gives children a chance to explore the great outdoors firsthand instead of just reading about it from a book, inside a stuffy classroom. You get to make discoveries for yourself and learn things you never knew before, you experience a adventure that a book with pictures just can't give.